How three credit unions are pushing their physical locations into the future. Read about all the branch designs or skip to the section you want to read by clicking on the links below. Nationwide, credit unions operate more than 20,000 branch locations. But an institution’s physical footprint often extends beyond these member-facing spaces and into workspaces for support staff. Although different, both spaces share one important similarity: the need for practical design. Branches house tellers, loan officers, managers, and more, but they must also be functional spaces for members. Administrative buildings, on the other hand, are focused on employees. These are spaces that encourage productivity, efficiency, and innovation. Ideally, they also promote a positive and engaging atmosphere that keeps employees happy, healthy, and motivated. Credit unions can approach HQ and branch design in several ways. Here are three. 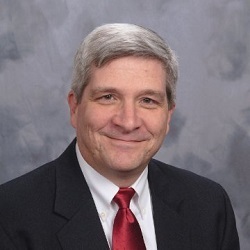 For nine years, Directions Credit Union ($660.7M, Toledo, OH) has operated two administrative facilities, a headquarters and a loan servicing facility, in its Toledo, OH, market. 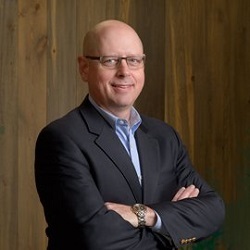 According to Directions CEO Barry Shaner, technology allows the two facilities to keep in touch despite their day-to-day separation, but there’s no replacement for happenstance run-ins. “There’s a lot of natural interaction and collaboration that doesn’t occur when you are separate,” the CEO says. So, when the credit union had to increase staff at its HQ-based contact center and the loan servicing facility, which houses 35 employees, started growing too tight, Directions kicked off a plan to combine them into one large facility. That facility is three floors of the second-largest building on the Toledo skyline, the former headquarters for Fortune 500 company Owens Corning. In early 2017, Directions announced it is taking over 34,000 square feet of space inside the building, which has been vacant for 20 years. The Directions logo will sit atop the building in hopes of attracting the young residents of the city, and the credit union will redesign the empty space within to create a more interactive environment. The new headquarters will contain only a few private offices, mostly for human resources. Instead, employees will sit at low-walled cubicles while small groups can gather at collaborative spaces Shaner calls “magnet locations.” The overall intent of the space design it to encourage employees to move freely throughout the facility and interact with one another. There's a lot of natural interaction and collaboration opportunity that doesn't occur when you are separate. The credit union doesn’t have formal renderings of the space, but it does expect to move in by the end of 2017. “Loan reviews allow us to evaluate the effectiveness of our policies and procedures, our service providers and business partners, and our employees,” Vesell says. Like what you’re reading? Callahan Basic provides even deeper insight to help your credit union thrive with enhanced access to CreditUnions.com and industry publications. HAPO Community Credit Union ($1.5B, Richland, WA) has 17 branches and a handful of buildings that are all located in southeast Washington and northeast Oregon. But as HAPO expands its reach into Vancouver, WA, which is in the southwest corner of the state, its physical footprint is following suit. “We’re opening a regional headquarters to anchor our expansion on that side of the state,” says HAPO CEO Steve Anderson. Expanding into a new market can be challenging. Without a differentiating factor, it’s easy to get lost in the sea of financial services providers. That’s where WELL comes in. HAPO uses Momentum for its building and design needs. Find your next partner in Callahan’s Buyer’s Guide today! The WELL Building Standard advances the health and well-being of employees through its building designs. WELL considers seven design concepts: air, water, nourishment, light, fitness, comfort, and mind, and requires the tenants of its buildings to meet baseline requirements before receiving certification. And once it receives certification, HAPO will have to maintain WELL standards through third-party, on-site evaluations conducted every two years. I want a building that will defy expectations for the people who come to work in its and for the people that come to do business with us. HAPO considers this level of scrutiny worth it if it helps the credit union operate more closely to the values it espouses. 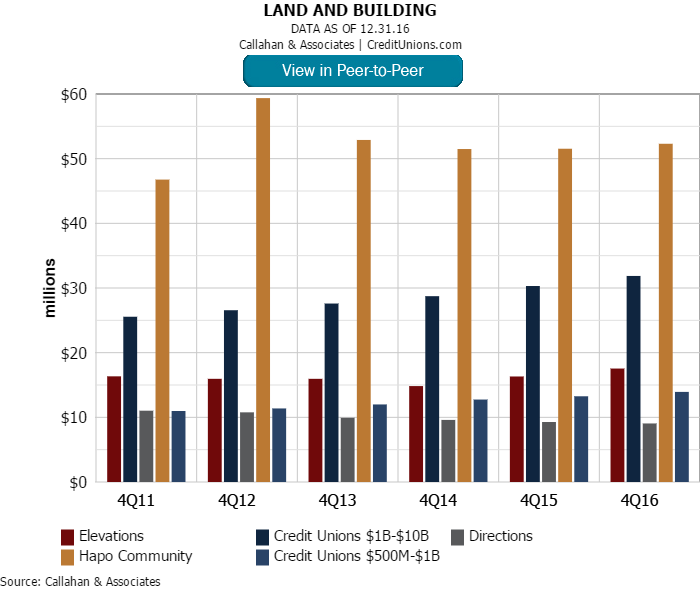 For their size, Elevations Credit Union has fewer branches than the typical credit union in its $1B-$10B asset-based peers, while Directions Credit Union has more than its $500M-$1B peers. The efficiency ratio measures how much the credit union spends to create $1 of revenue. 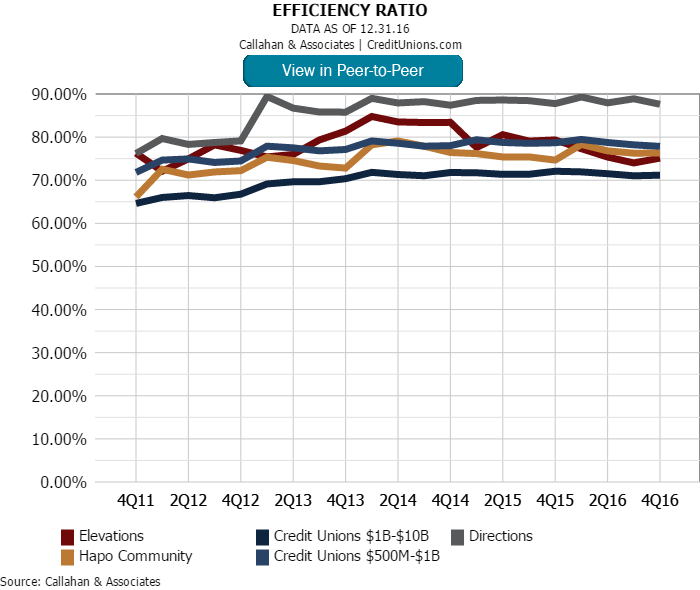 Directions' rates approximately 10 percentage points above its asset-based peers, while HAPO and Elevations' efficiency ratio sits near the average performance of credit unions $1B-$10B in assets. Since 2011, Elevations and HAPO have increased the amount spend on land and building, while Directions has decreased this investment by about $2 million. 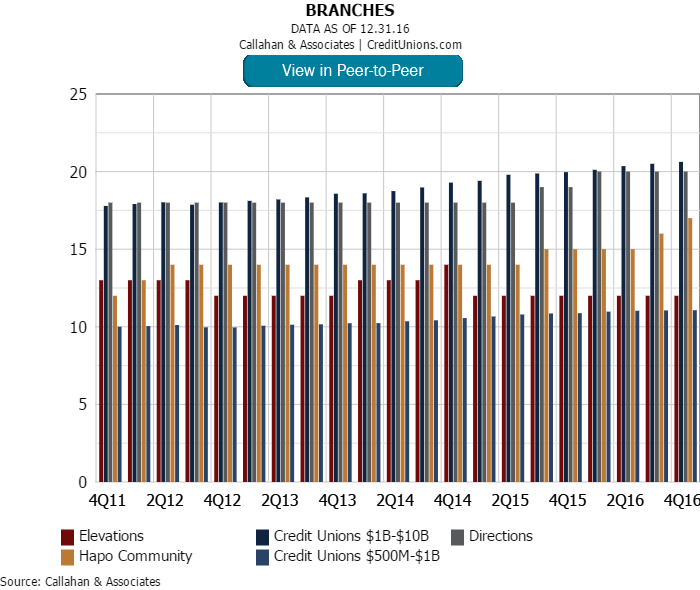 Elevations Credit Union ($1.8B, Boulder, CO) thinks seriously about the future of its branches. Walk-in traffic is in decline and mobile transactions are on the rise. The combo necessitates a change to the established branch structure, but what kind of change? The credit union undertook a brand articulation exercise in 2012, dubbed Branch 2.0, that involved reading about branch design, developing a member survey, and visiting Wright-Patt Credit Union ($3.4B, Beavercreek, OH), University Federal Credit Union ($2.1B, Austin, TX), and Extraco Bank for inspiration. From that exercise, Elevations developed a community-connected, consultative branch with more offices and more opportunity to sit side-by-side with members, says chief operating officer Jay Champion. The first of these branching concepts opened in 2014. See what's out there. Then make it true to your brand and your culture. The credit union swapped teller lines for pods — a la the Apple Genius Bar — and retrained tellers as universal employees, which Elevations calls “guides.” The credit union’s 45 guides can approve HELOCs, consumer loans, and mortgages as well as offer wealth management and business banking services. The teller role isn’t completely disappearing, however, as Champion admits not all employees can or will make the jump to the universal model. Directions is considering keeping the traditional teller line in some of its new branch concepts, which will accommodate its staff of 40 traditional tellers. Aesthetically, Elevations’ Branch 2.0 design heavily incorporates local pine wood and translucent glass. Chalkboard signs in waiting areas show off the credit union’s connectedness to its community. “For example, the chalkboard might display the number of small businesses Elevations serves in Fort Collins,” Champion says. Thus far, the credit union has premiered five 2.0 branches — two retrofitted and three new builds. According to Champion, the costs are approximately the same and the results have been positive. 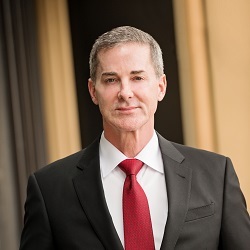 The 2.0 models score, on average, 12 points higher in Net Promoter Score surveys, the COO says, and loan production and services per household rank higher in the updated branches than in traditional ones. Elevations has 12 branches and will introduce the 2.0 vision to individual locations as they need remodeling. Check out the video below to learn more about the credit union’s Branch 2.0 model.